Well, this one’s bound to generate some comments. Given the sensitive and potentially offensive nature of the imagery involved, it’s probably even more important than usual for me to put it in context, here. Several weeks ago, I read an article discussing how much Mitt Romney had to spend per vote to win the Republican nomination, as well as the projected influence of Super PACs over the 2012 Presidential Election. The headline alone had me immediately reflecting on how the Presidency, as well as most significant political power, is more often bought than it is earned, and the Supreme Court ruling which laid the legal framework for Super PACs only serves to amplify the voices of monied interests and corporations that were already drowning out commoners like you and me before! I had the idea that it might be clever and deeply meaningful to illustrate the influence of Super PACs in the form of the two most well-known personifications of positive American ideals, Lady Liberty and Uncle Sam, being auctioned off as slaves to the highest bidder. After all, slavery represents one of the most universally recognized low points in American culture, perhaps even the nadir, so the contrast between positive and negative is made all the sharper by that juxtaposition with the two allegorical figures. I did consider referencing less racially-charged or more temporally-distant slave trades, such as those that occurred in ancient Rome, and which have provided material for a number of paintings throughout history. But, after thinking about it for a while, I decided that since the topic of the cartoon would be American laws governing American elections which determine American policy, the metaphor had to be distinctly American. After that, it was a matter of whether or not the literal subject matter carried the necessary gravity to merit framing it with something as serious as slavery in the Old South. I didn’t want to demean the victims of the Atlantic Slave Trade by comparing their plight to something relatively harmless. I don’t think this has that problem, because Super PACs certainly threaten to undermine individual liberties and legislation that would make it more difficult for companies doing business in America to engage in the slave trade abroad, for example. Furthermore, many illegal immigrants, plus a sizable portion of the (mostly minority) prison inmate population are being used as a slave class to prop up American hegemony even as I type this sentence. Some readers may notice that four out of the five Super PACs I called out in this cartoon are conservative, and only one (Priorities USA Action) calls itself “liberal.” While this may lead to a perceived bias in the commentary against conservatives over something that should be a problem for Americans of all political backgrounds, I must point out, I only went by which groups were biggest in terms of donations received and money spent, and the vast majority of those are conservative, even after omitting Super PACs set up to support specific Republican candidates who are no longer running. You can learn more about the Super PACs and people involved in this cartoon by clicking on them with your mouse. Stephen Colbert’s reporting on the topic of Super PACs has also been very enlightening. I want to encourage readers to research the history of slavery in the US as well, in order to better inform everyone’s historical perspective on both race relations and the leveraging of financial power to deprive others of freedom, the latter of which Super PACs promise only to make worse. Finally, I’d like it if people would think about a related issue that occurred to me while I was working on this: Liberty and Uncle Sam are supposed to be symbolic of all Americans, yet they’re both almost always portrayed as white. I made both of them black because I decided it would offensively ignore the historical realities of whites buying blacks if I were to use the characters’ traditional depictions. What do you think? Should artists referencing these two characters make more of an effort to vary their racial/ethnic backgrounds, in general or depending on the usage? Or should new, multicultural figures be invented, to better reflect the makeup of present-day America? I’m interested in your perspectives. This entry was posted on Friday, May 11th, 2012 at 4:37 pm	and is filed under Cartoons & Commentary. You can follow any responses to this entry through the RSS 2.0 feed. You can leave a response, or trackback from your own site. Let traditional figures remain as they are; eventually, they will fade from use and be a memory, warning & benchmark for future generations. Just to clarify, I don’t have much of a problem with either Liberty or Uncle Sam as they were traditionally designed. I’m just wondering why they always have to be portrayed as white, or why they can’t share the popular lexicon with similar characters representing other races, ethnicities, sexual orientations and religions. It’s very difficult (if not impossible) to boil the melting pot of American culture down into a single personification who won’t disproportionality represent some group more than others, so I think it’s something that just comes with the territory of visual metaphor. Unfortunately, this is the kind of thing a single person can only affect the cultural consciousness on if he’s very well known and widely distributed, so I’m probably not in a position to introduce any such characters by design instead of accident. I’ve been pushing Mr. C.E.O. for years, and despite being essentially a distillation of existing corporate fat-cat cliches, he hasn’t really caught on anyplace else. Here’s a comment: How dare you give insightful and well-reasoned commentary and response to an editorial cartoon! Shame on you! Haven’t you seen 99% of political cartoons!? I will admit this myself, though: At first glance I assumed it was the president and first lady. Whoops! When I saw this, I instiantly understood the message and meanings presented. I’m glad you gave more insite for those that are not as open thinking and understanding of history and what really is going on. But this is something that can apply beyond just the super PAC, as it really is liberty and justice to the highest bidder. Wow. Posted a blurb and a thumbnail on my site pointing back here. Great job. 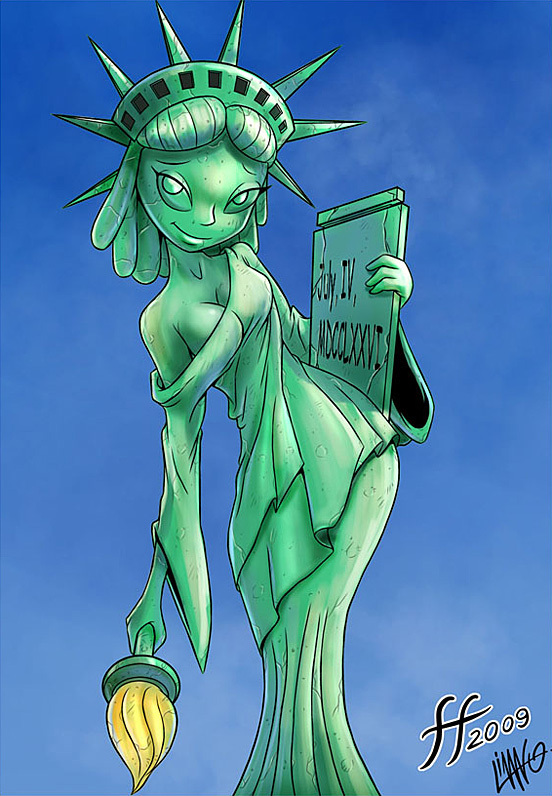 What are you talking about, Lady Liberty is almost universally depicted as a woman of colour (green)? That said, I see no reason why we can’t or shouldn’t diversify such symbols.